KAMPALA- In a rare admission from a senior government official, Finance Minister Matia Kasaija has said the country still has a long way in eliminating corruption. Addressing journalists after opening the Eastern and Southern Africa Association of Auditor Generals in Entebbe on Monday, Mr Kasaija said corruption has eaten up the moral fabric of society with the culture of get-rich quick making it difficult to eliminate it. 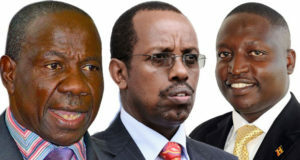 Last week, a report by Transparency International ranked Uganda among the most corrupt countries in the world and the minister yesterday many government agencies do not have the capacity to fight corruption, while other government agencies are infiltrated by corrupt individuals. “In my ministry, I see weaknesses where money is quickly dis-patched to somebody and with the introduction of the electronic funds transfer system, money moves very fast. People are hacking into our systems to steal…,” Mr Kasaija said. He urged everyone to join the fight against corruption, saying it’s not only the responsibility of the government. “You know me I am an NRM cadre, when we were in our struggle fighting to put this country in order, we were supposed to be the cadres of the movement not to divert from the principles of the party. But unfortunately, we are not many and many of us are disappearing. Fighting corruption should not be left to the government alone,” the minister added.